In the first two games with USC, Oregon went down to the final minute before losing to the Trojans. There would be no last second defeat as this game was relatively over at halftime. USC advances to the Pac-12 tourney final after a 74-54 win over the Ducks Friday night in Las Vegas. It’s the third time the Trojans defeated the young Oregon team and will now face Arizona for the conference tournament championship. 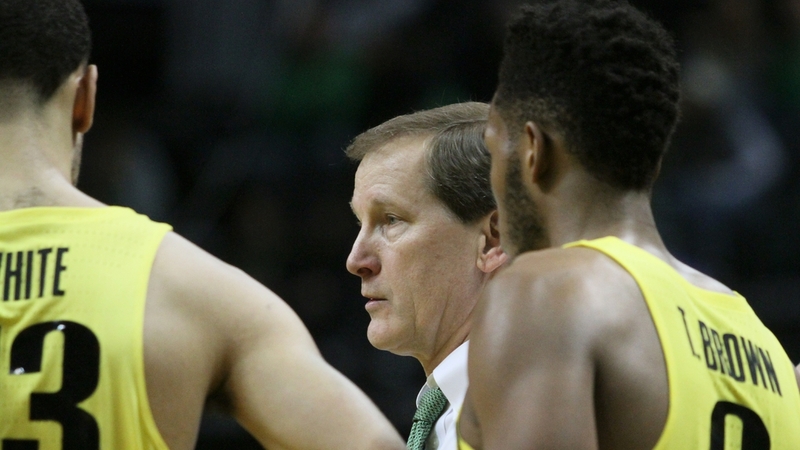 As for the Ducks, they fall to 22-12 and will surely play in the NIT next week. The opponent and where the game will be should be announced Sunday night. Oregon hopes to make it a busy week for Matthew Knight Arena officials with a home game with the women’s team hosting the first two rounds of the NCAA tournament. Oregon obviously didn’t have it on this night after playing an overtime game against Washington State and then a close affair with Utah in the quarterfinals. At one point, the Ducks missed 15 straight field goal attempts and USC built a 28-point lead at 53-25 with 15 minutes left. Jonah Mathews led all scorers with 27 points on 8-of-10 shooting, including seven treys for the game. MiKyle McIntosh solidified his spot on the all-tourney team with his third straight big game. He led Oregon with 21 points. Elijah Brown added 16 with Troy Brown scoring 11. The NIT pairings will be announced on Sunday with a selection special on ESPNU at 5:30 pm.